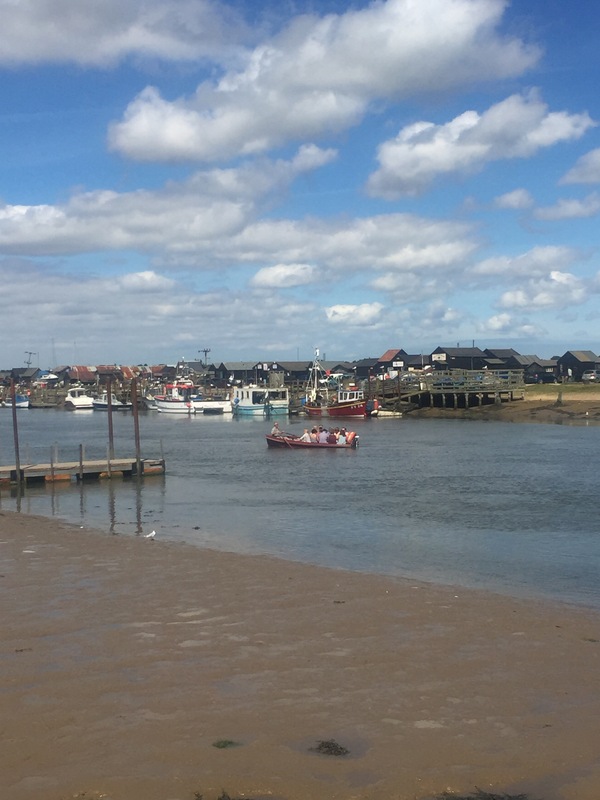 Earlier this week we were joined by six other members of the Postcard family and took a short trip across the River Blyth from Southwold to Walberswick. For the princely sum of £1 you can be rowed across the river, but we were traveling in such a large group that we opted for four wheels rather than two oars to get there. It’s a picturesque and peaceful spot popular with families who were out enjoying a bright summer’s day. 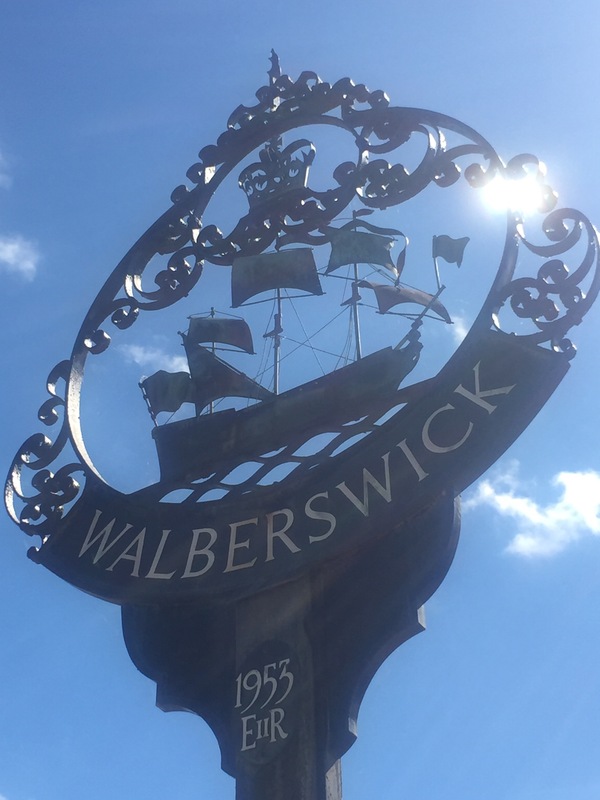 Walberswick is famous for something other than being pretty…. crabbing. 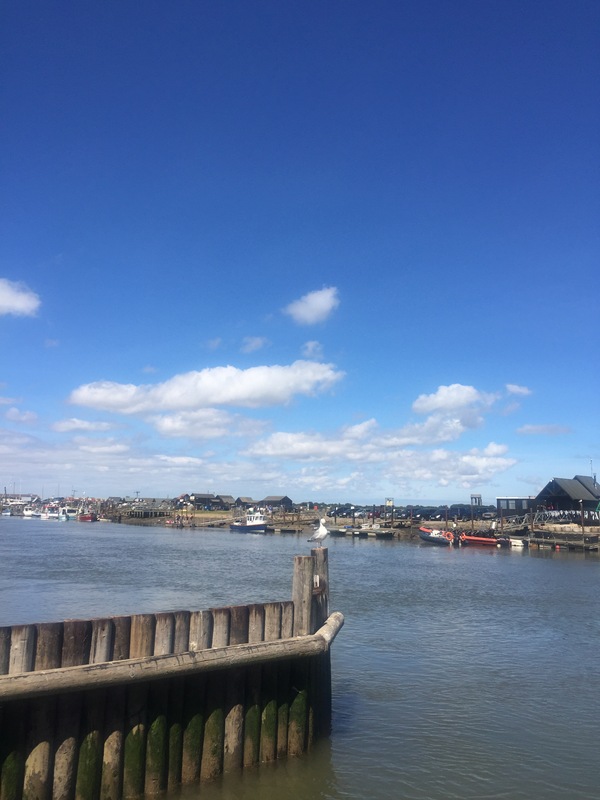 It’s the home of the World Crabbing Championships after all, so we thought we’d have a go. 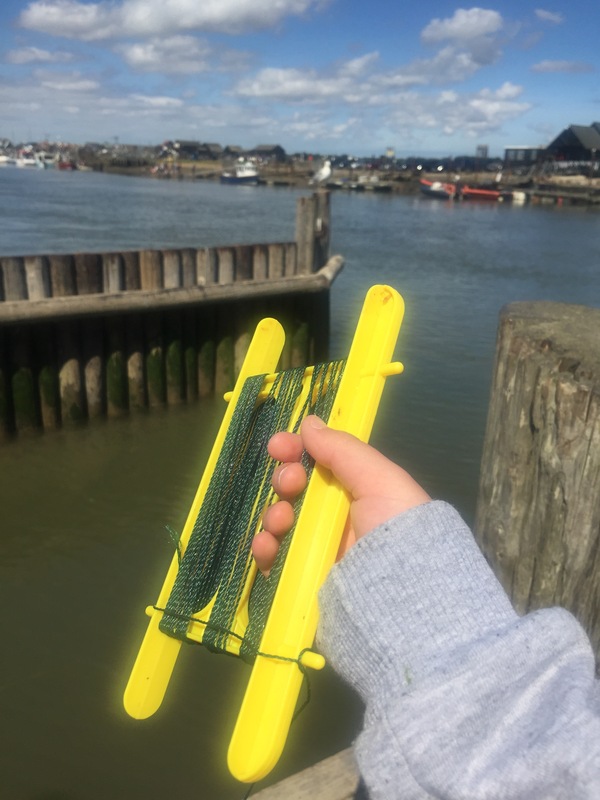 Armed with bait (bacon), a crabbing bucket, net and several crabbing lines we set off on a crabbing adventure. After a long wait with our lines, we got a nibble, we got 3 or 4 in fact but each time we tried to pull the line up and out of the water the crab let go and plopped back into the water. 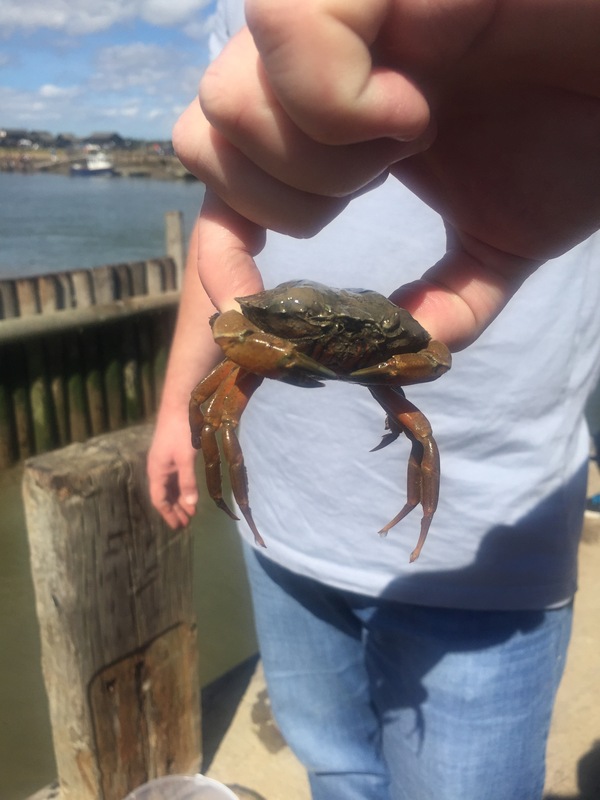 Eventually, one of our party waded into the shallows and scooped up the ultimate prize in the net… a crab!!! 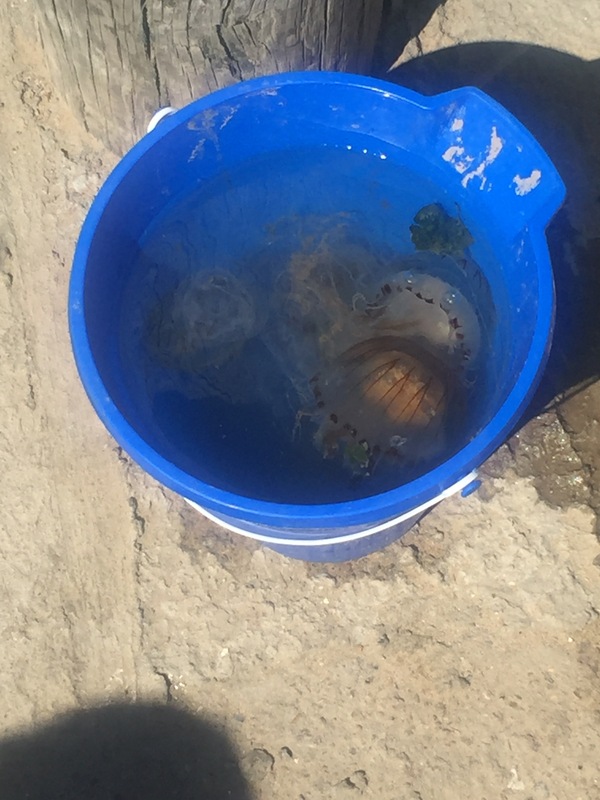 A neighboring family had much more success with a multitude of crabs, fish and even a bucketful of jellyfish. 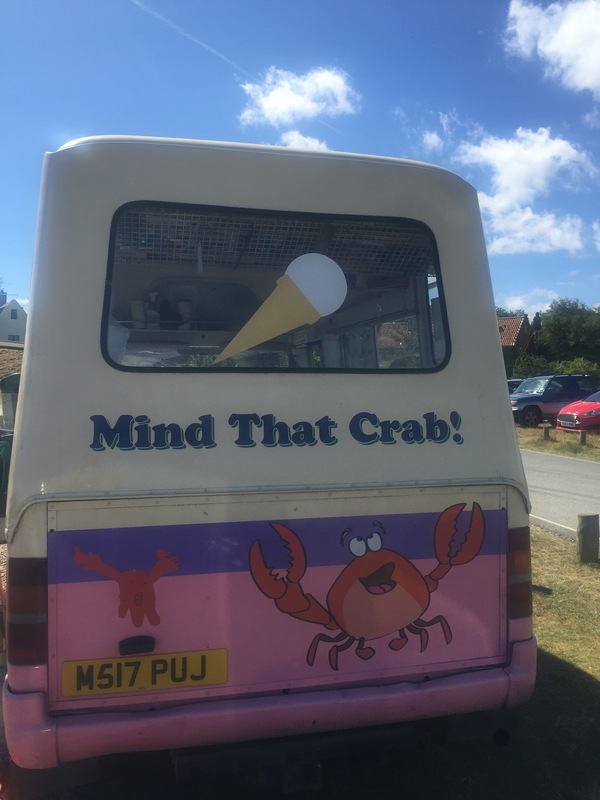 After Crabby the crab was returned to his home, we walked back towards the village centre – there are crabs everywhere round here! 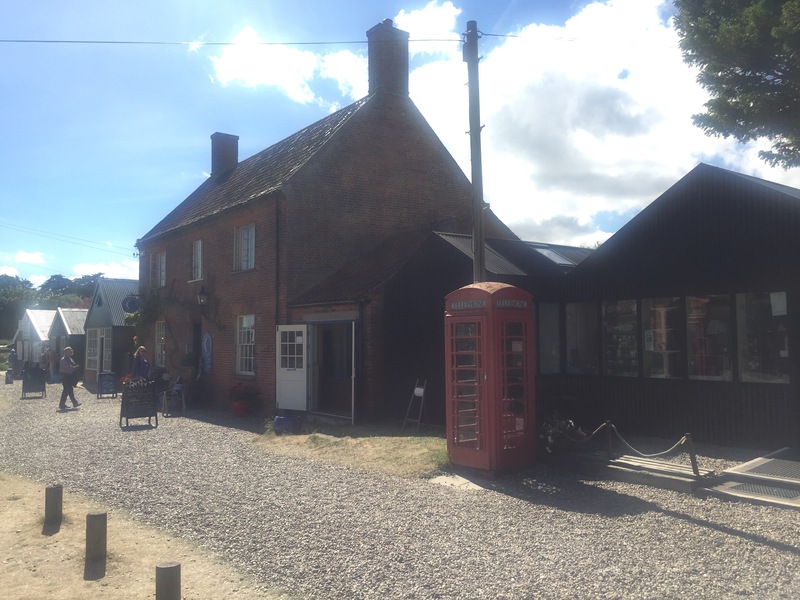 And we ended up in this gorgeous little place nestled behind the Bell Inn. 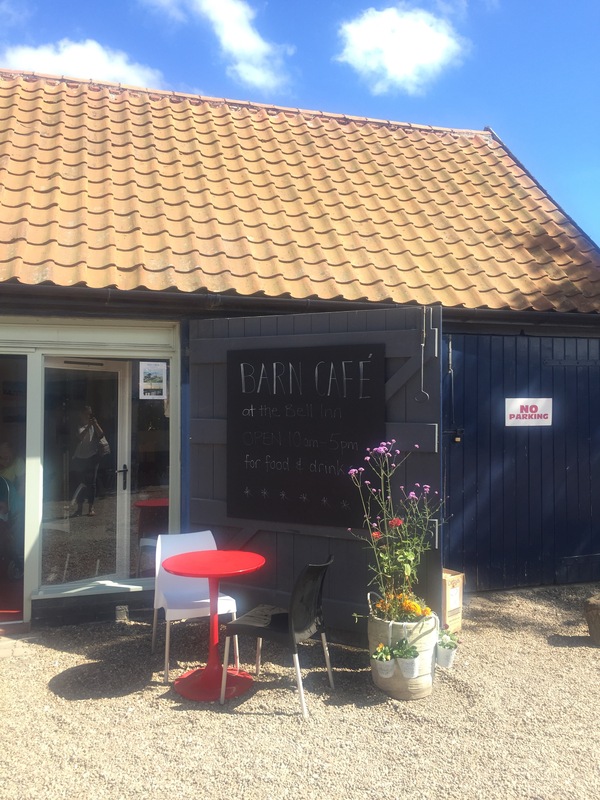 It’s called the Barn Café. 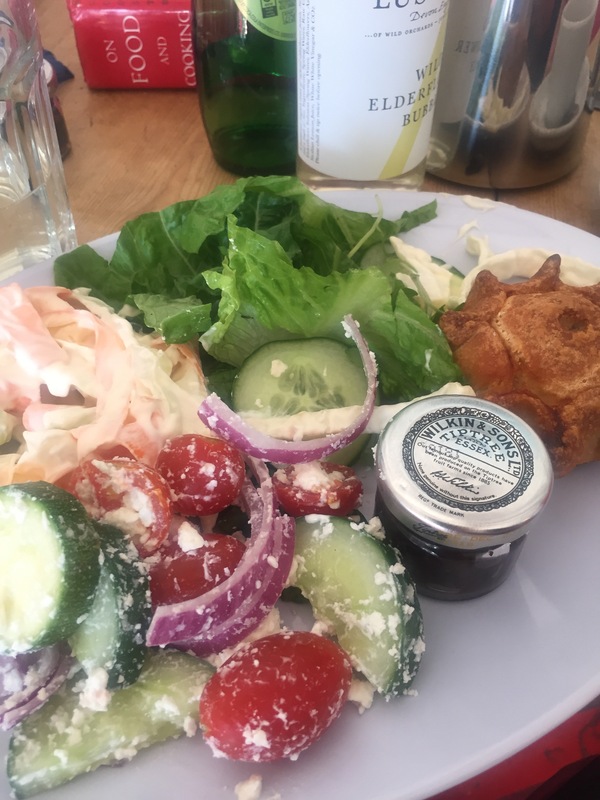 I had a gorgeous lunch of locally bred pork pie – delicious! In the loos of the neighbouring pub there were crabs there too! 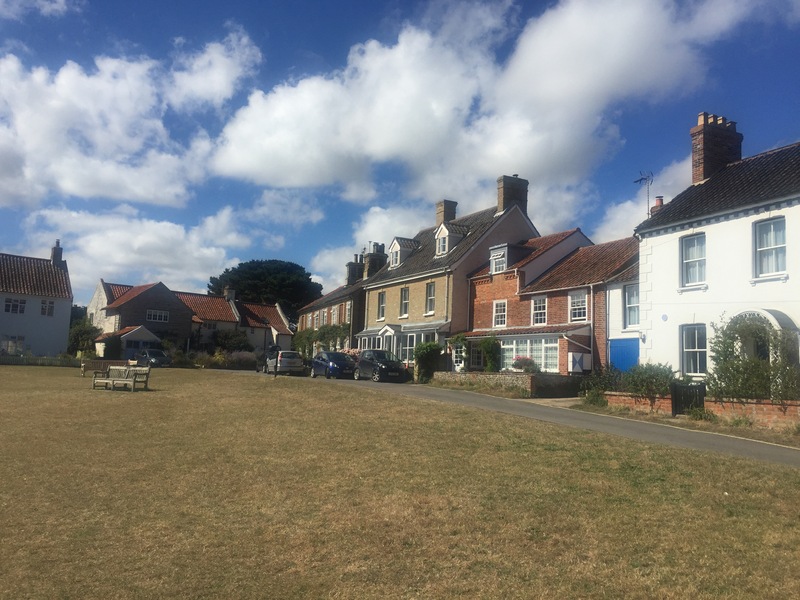 After lunch a short stroll took us into the village centre with its lovely village green. 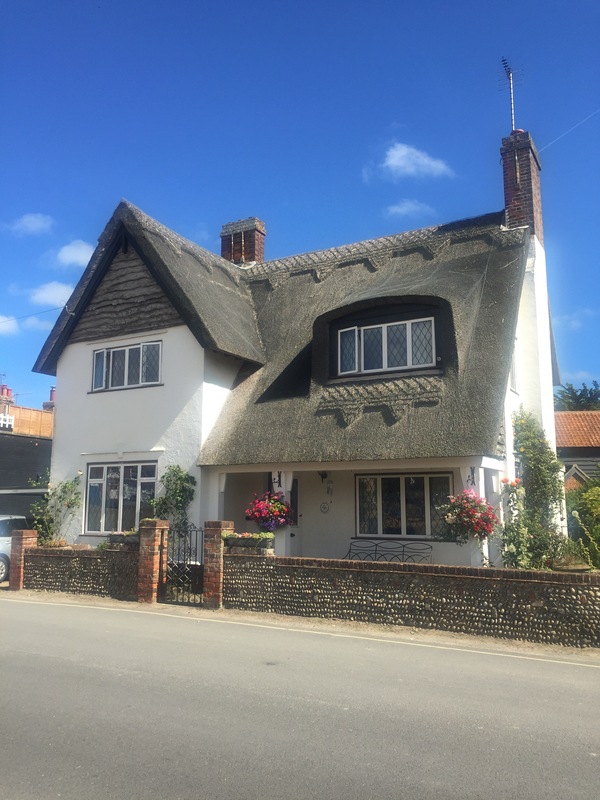 Ooh it’s so pretty here with thatched cottages and gorgeous little gardens. 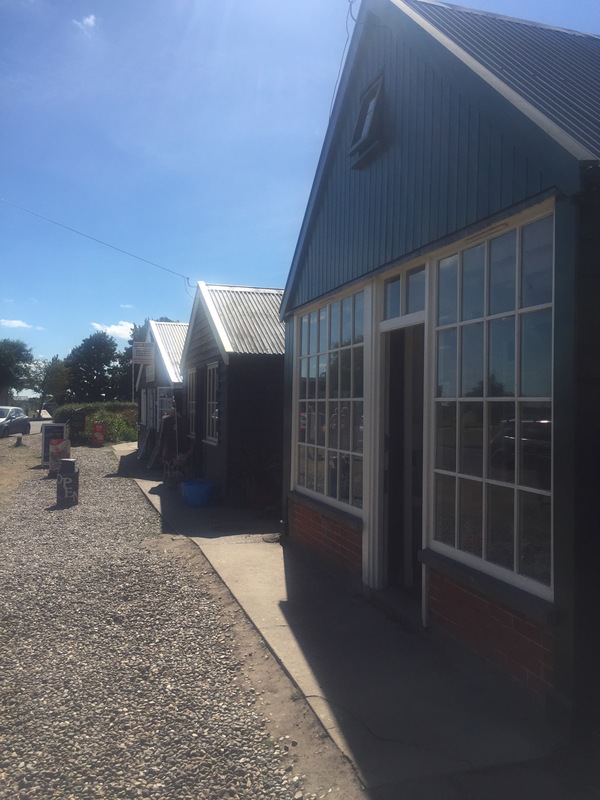 There are a few small shops selling local crafts, cakes and souvenirs. 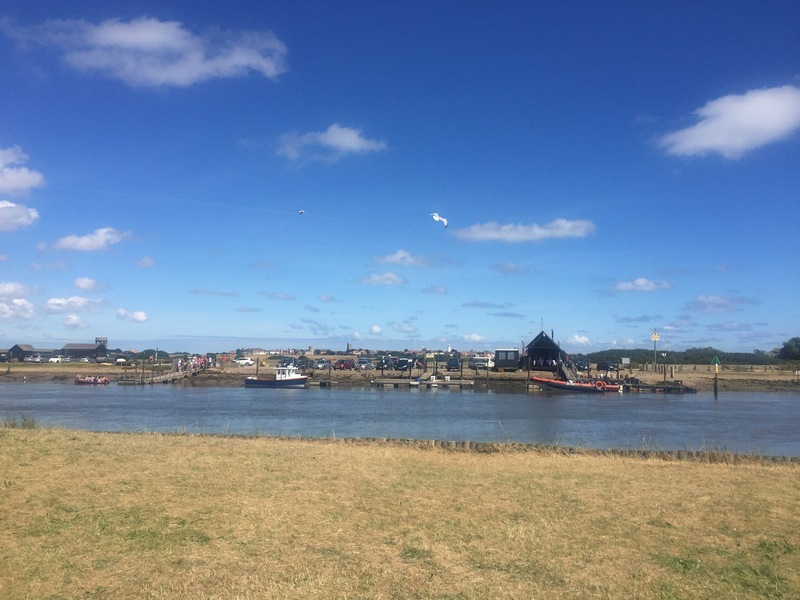 We really enjoyed our trip to Walberswick- it was a treat for all the family. 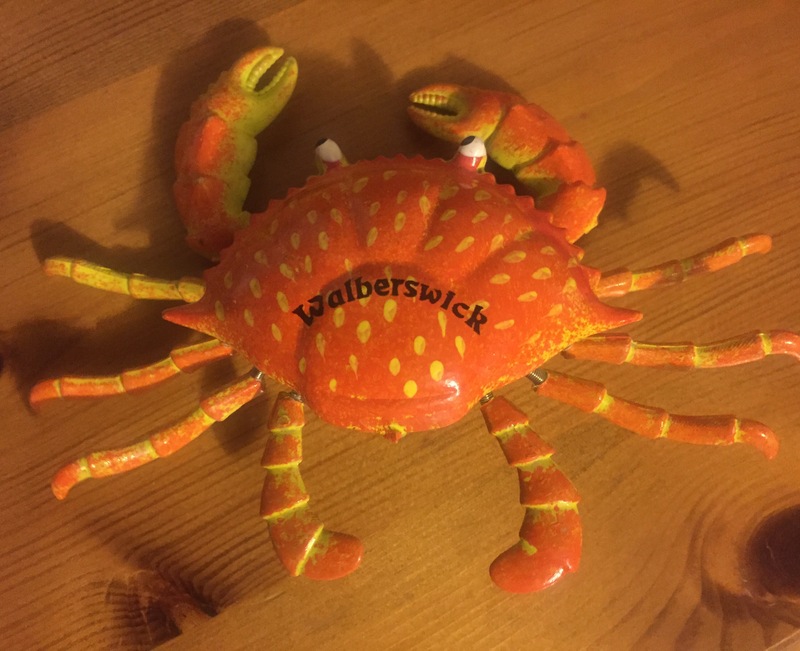 We even brought a crab home with us! Love a bit of crab meat, yummy! 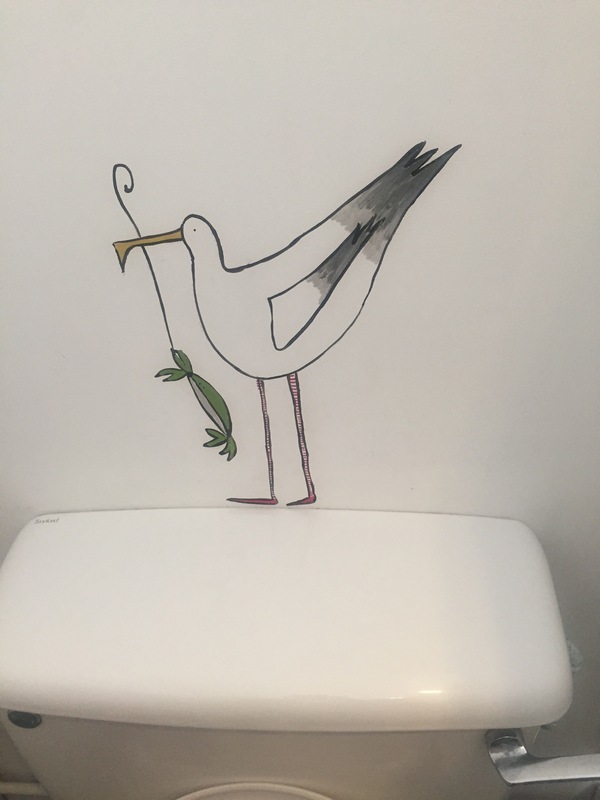 Love the crab with the gull in the toilet. Norfolk is somewhere I have never been and seeing your posts,I don’t know why!